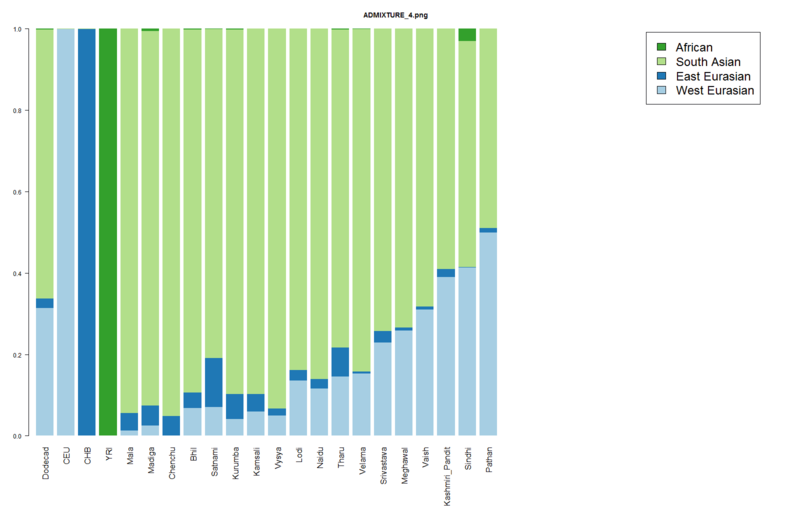 I have taken the 22 Project participants with a membership of at least 1/4 in the "South Asian" component of the K=10 standard analysis and ran them together with the populations of the "Indian Cline" described by Reich et al. (2009), as described here. Since some of the Project's participants have either African or East Eurasian admixture they do not fall strictly along the "Indian Cline" between West-Eurasian-like Ancestral North Indians (ANI) and indigenous South Asian Ancestral South Indians (ASI). 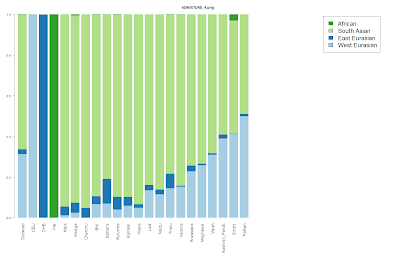 I therefore included HapMap Yoruba and Beijing Chinese to weed out these influences and ran a K=4 analysis. 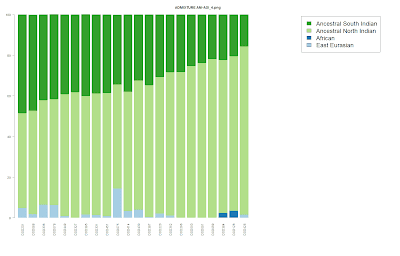 Surprisingly, either the inclusion of the Dodecad participants and/or the African and Chinese controls has served to better flesh out the Indian Cline in the ADMIXTURE results. 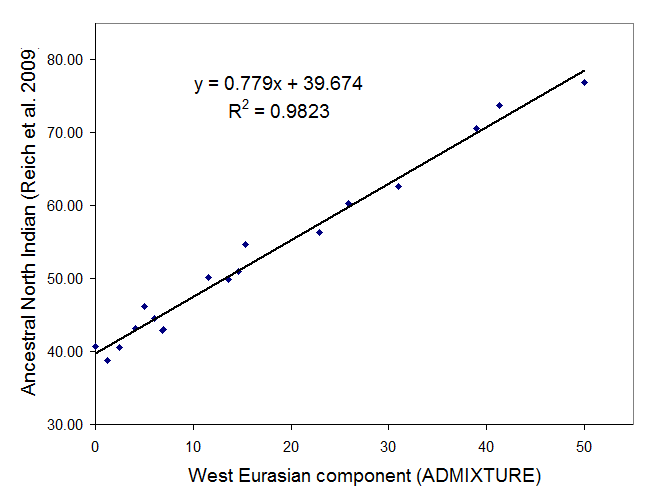 Below is a scatterplot of the "West Eurasian" component inferred by ADMIXTURE vs. the Ancestral North Indian (ANI) of Reich et al. (2009). 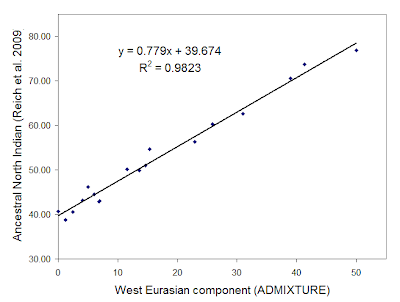 R2 =0.98 indicates that the ANI component can be inferred almost perfectly by the West Eurasian ADMIXTURE percentage. 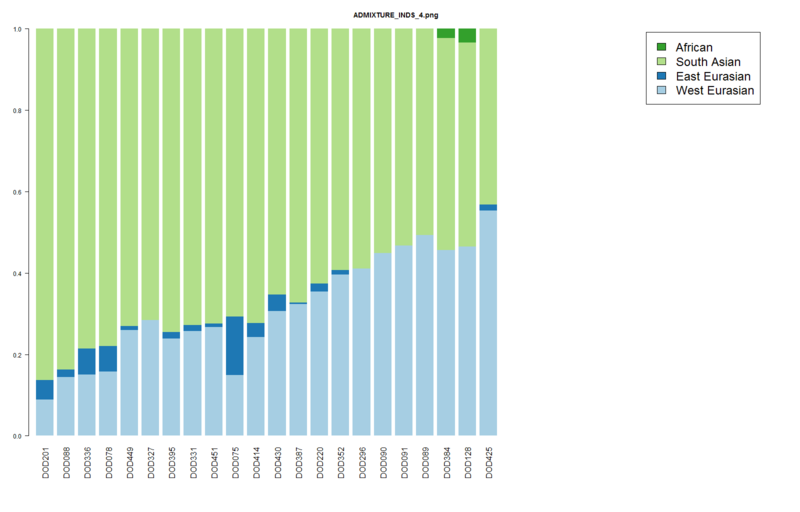 Dienekes, considering there has been an appreciable influx of South Asian individuals into the project (as you can see there are a lot new ones in the K=12 neighbor joining tree), would it be possible for you to re-calculate the figures for the new participants when time permits you to do so? 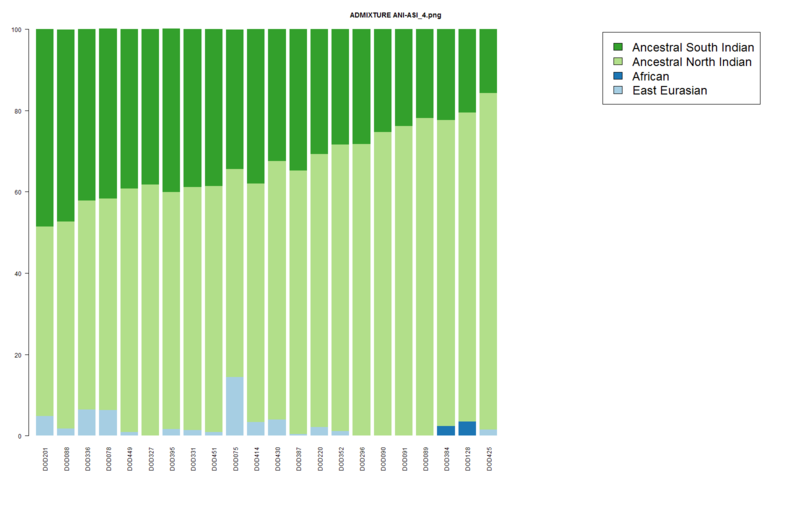 It'd be great to have a PCA vs ADMIXTURE comparison, and also possibly the Fine Scale analysis. I remember you saying in a private correspondence that you would repeat the admixture exercise once you got a substantial amount of new SA participants to make it worth your while, hence I was wondering.